1 of 4 Heat oven to 350 degrees F. Unfold piecrust and let stand at room temperature. Meanwhile, combine tapioca, 1 cup sugar, lemon juice and cinnamon in large bowl. Add blackberries, raspberries and blueberries; toss. Let stand 20 minutes. 2 of 4 Using a 4-1/2-inch round scallop-edged cookie cutter, cut 5 rounds from piecrust. With a 1-inch scalloped or star cutter, cut from the center of each circle. Reroll scraps; use to cut one more 4-1/2-inch round as above for a total of 6. 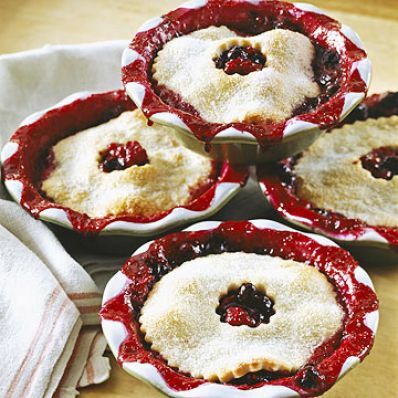 3 of 4 Spoon 3/4 cup berry mixture into each of six 4-1/2-inch pie plates or 4-1/2-inch large custard cups. Place 1 pastry round on top of fruit in each. In small cup, slightly beat egg. Brush egg over pastry; sprinkle remaining 1 tablespoon sugar over the six pastry pieces. Place pie plates on large baking sheet. 4 of 4 Bake in 350 degrees F oven for 12 to 15 minutes or until crust is golden and mixture is bubbling. Remove pie plates to wire rack; cool slightly. Serve at room temperature.